Vantage 4.0 uses three different menus Two for the top main navigation. One in the footer for social icons. On new installs, your menus should already be setup correctly. If not, follow this tutorial on how to manually set it up. 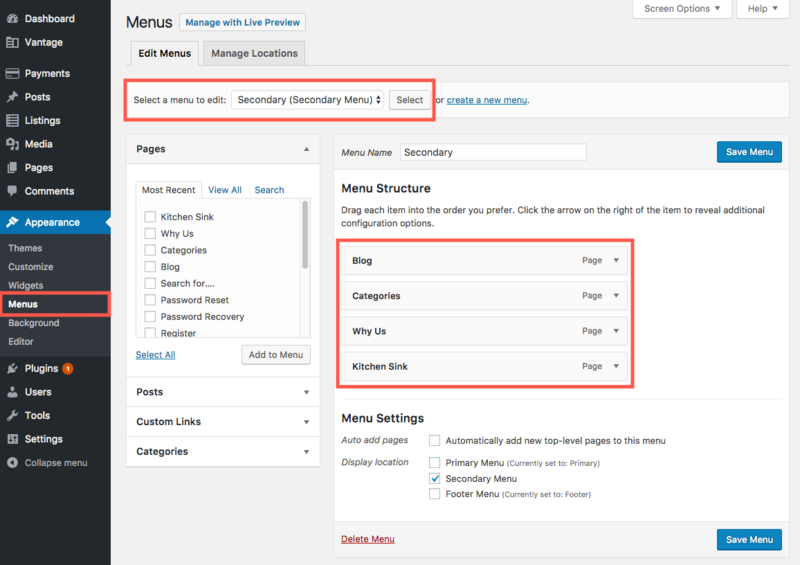 When you view your website, you should see the following menu locations setup. The actual menu items might be different but there should at least be some menus shown. 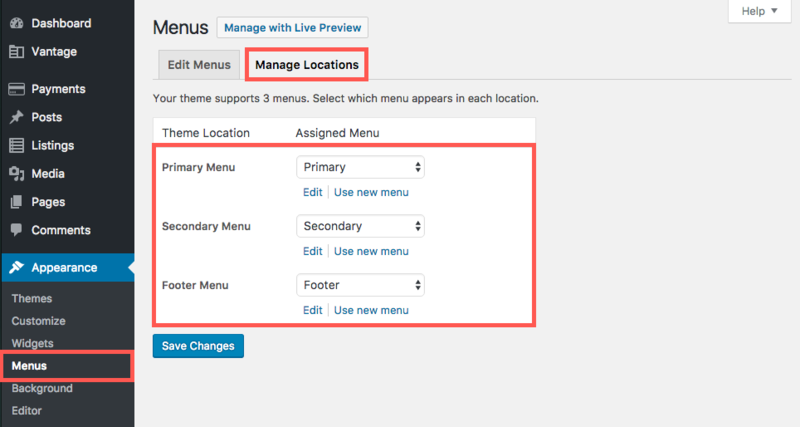 If not, you’ll need to manually create three new empty menus (Primary, Secondary, and Footer). Now it’s time to add content to your primary menu. These are basically links to other pages on your site. In the above screenshot, you’ll see two menu items. 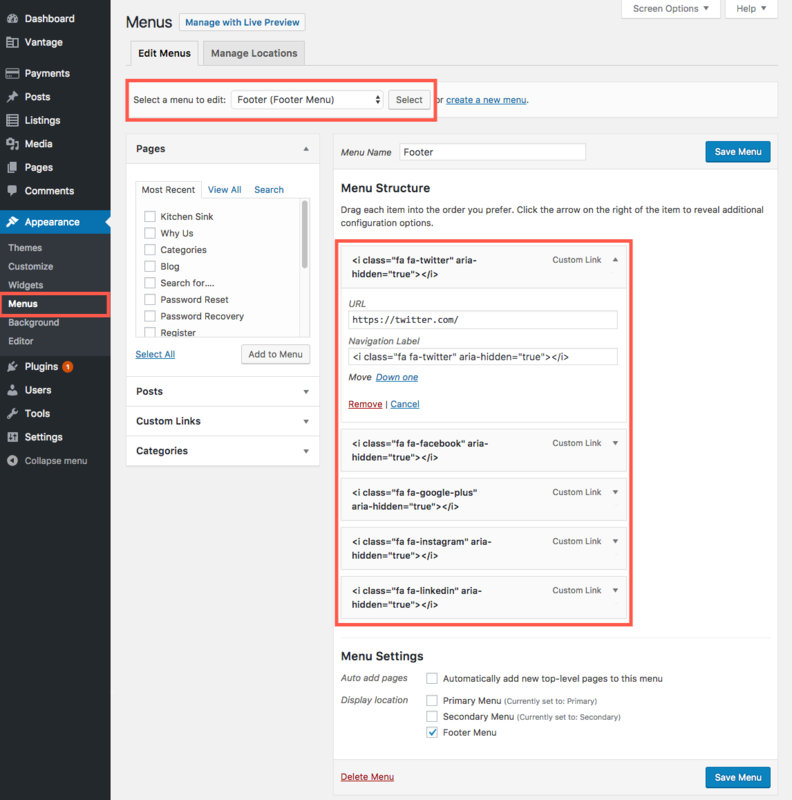 “Create Listing” and a dropdown for the user logged in. If the user wasn’t logged in, you’d see “Login” and “Register” button (if registration is enabled. As of version 4.0.0, you cannot customize or move the login/register or user dropdown elements. Let’s add the “Create Listing” link. Pro tip: Vantage 4.0 includes Font Awesome so you can easily embed any icon from their collection. On our demo site, we use the plus icon before the text. 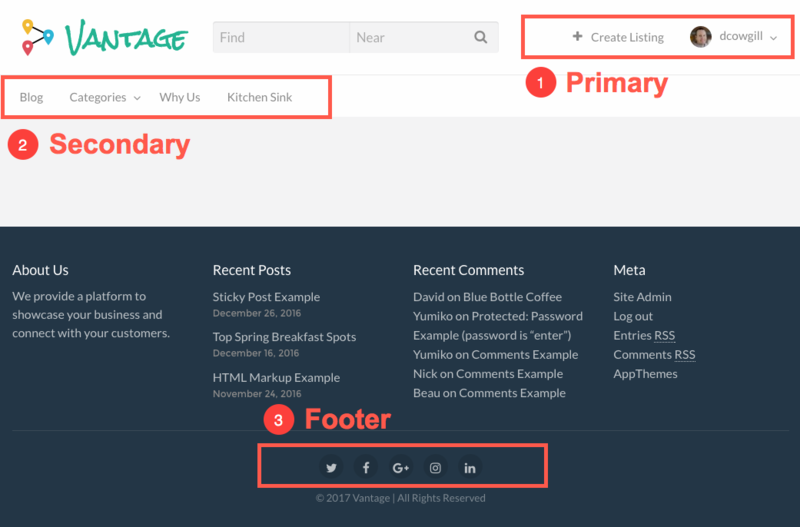 Copy and paste the snippet below into your menu’s Navigation Label. 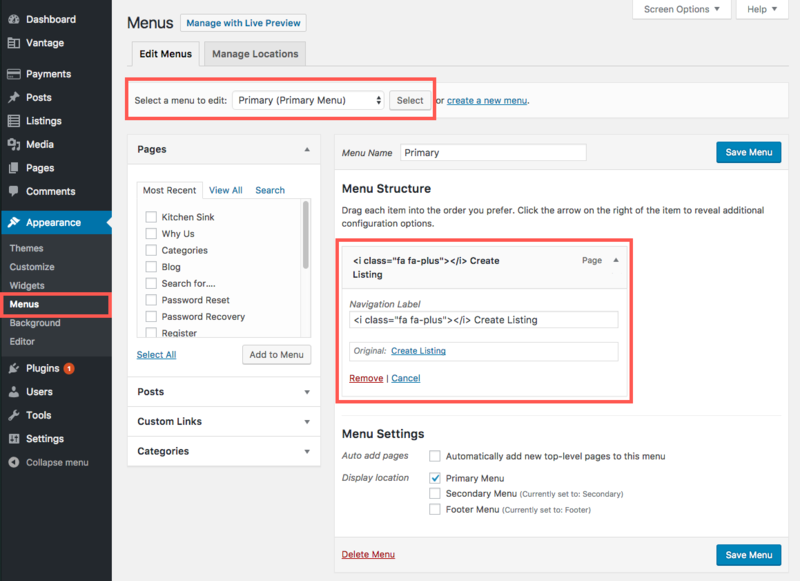 Now it’s time to add content to your secondary menu. This is basically your main site navigation. You can add whatever pages you like here. See the screenshot for the pages our demo site uses. We basically follow the same steps as above. 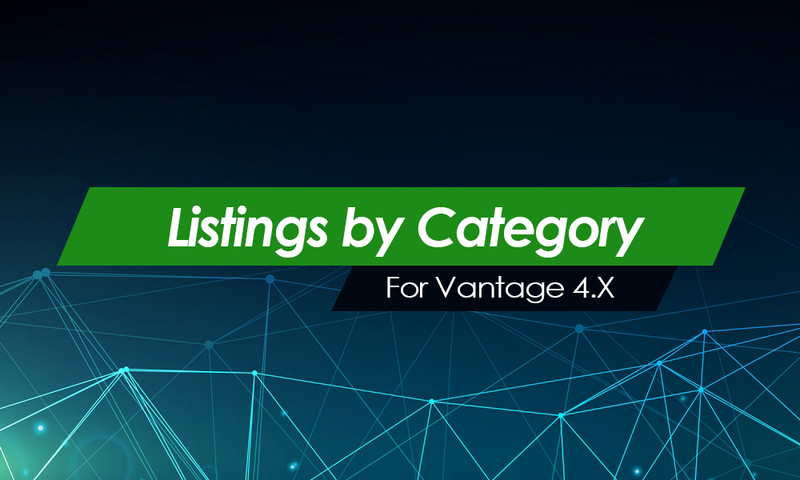 Note: The categories page uses a shortcode to generate a list of all listing categories and build the dropdown menu. If the page is empty, you’ll need to add the shortcode. See this tutorial on how to add it. The last menu is the footer which contains the social media icons. They aren’t actual pages so we need to create “Custom Links” instead. Let’s add a custom link for Twitter. Repeat all steps again for each and every social media icon you wish to add. To save you time, here’s a list of what we use on our demo site. Note: Don’t forget to replace each url with your own personal url.